Drive efficiency and accuracy with Concur and Itinerary Capture from Ctrip Corporate Travel. integrated travel and expense solution. Concur has joined forces with Ctrip Corporate Travel, China’s leading online travel agency, to launch a one-stop travel and expense management solution that delivers an integrated, automated experience for business travelers in China. Itinerary Capture from Ctrip Corporate Travel simplifies the business traveler experience in China by streamlining pre-trip approval, booking, and expense management. The Concur and Ctrip Corporate Travel solution integrates and automates pre-trip approval, travel booking, and reimbursement into a single streamlined workflow—with no additional intervention required. Control every dollar you spend. The single platform enhances insight and analysis, providing better visibility into comparison for budgeted and actual spending. Approvers see travel details and policy compliance pre-trip, and the solution notifies you post-trip if pre-approved data is different in the expense report. As a result, you can control budget more tightly and prevent out of policy spending. Many businesses using Ctrip Corporate Travel have saved up to 45% of expenditures during the reimbursement process. Make smarter decisions—using richer data. Taking advantage of the rich data capabilities in the Concur and Ctrip Corporate Travel solution, you can make better-informed decisions about budgets, policy compliance, supplier negotiations, and duty of care initiatives. 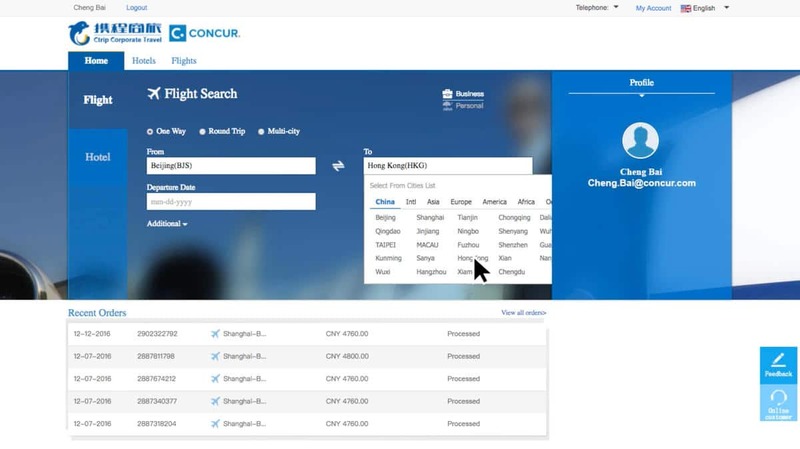 Through the connected Concur and Ctrip Corporate Travel platform, air tickets and hotel vouchers are automatically issued after travel requests are confirmed. And itinerary and expense items can be allocated to employees with zero hassle. Because the entire process is more efficient, employees traveling in China can focus on their work. Helping you deliver the experience your travelers want. With the Concur and Ctrip Corporate Travel solution, you can streamline your travel and expense experience by integrating travel and expense reporting and approvals and automating expense management. The result? An efficient, productive, pain-free experience for business travelers in China. See how your organisation can use the integrated Concur and Ctrip Corporate Travel solution to drive automation, reduce expense processing costs, and improve compliance with corporate policies.